Many of us want to know the career opportunities available in a particular field before acquiring the required skill set. I encourage you to follow your passion. There are plenty of jobs available to everyone in every field. You have to check which job hunting techniques work for you. More on this, later. Here’s what my research says about the best jobs for the future and how you can make the best out of it. When I started writing online in 2007, there was only Orkut available and LinkedIn was taking shape. I didn’t have a presence on social media at that time. In the last 8 years, I have a strong presence on Facebook and LinkedIn. I wanted to increase the presence of FinanceWalk on social networking sites, I contacted a few of my friends and came to know how busy they were. Almost all of us have a presence on these social networking sites, but have you thought of making a career in it? I just typed ‘Social Media’ on SimplyHired’s site here and got 36,510 results for jobs available in social media in the USA alone. This, of course, excludes the jobs that are not advertised as 60% of the jobs are never advertised and filled through references. So, social media marketing effectively is important for people who want to make a career in this area. Those of you interested in making a career in this field should be well trained in LinkedIn, YouTube and other social network marketing. I came across these exceptionally useful training resources available online. Think of this: According to one study, people who are under 40 today, will live over 100 years. The increasing number of jobs in healthcare can directly be attributable to the growing age of the population. People are living longer, so obviously, the doctors and support staff required for this population will be in demand. Medical technicians, physician assistants, therapists, dental hygienists and support and administrative people will be in top future careers. When we think of careers in Biotechnology, we imagine a scientist in a white coat working in a laboratory to improve our quality of life. But biotechnology has other careers in sales and marketing, research and development, manufacturing, quality control, and assurance. Here are some resources if you want to check out job opportunities in the USA. In technology, there are other areas—Nanotechnology and Energy technology—which will be top future careers. It is no surprise that computer engineering is one of the fastest areas in employment in recent years. The technological advances and its continued use in the public and private sector, as well as its usage in our daily life, ensures that this sector will remain one of the sectors that include in top future careers. Profiles like Information managers, systems analysts, developers and designers, testers, computer programmers, web designers, database administrators, and consultants will be in demand in the future. Hardware engineers will have a great future too. They will work in repair, cable, satellite, fiber and office automation. Click here to see the current opportunities in this area. Financial Analysts are always in demand. In future, there will be demand for risk management professionals, tax advisers, accounting and finance professionals, derivative strategists, financial modelers, and professionals in - Forex and money markets, asset management, capital markets, commercial banking, commodities, credit analysis, credit rating, equity research, private equity, quantitative analysis, investment banking, mergers and acquisitions, retail banking and insurance. Click here and check the current opportunities for financial analysts. Graduates and postgraduates can learn the skills required to perform as a financial analyst. You can learn all the skills required to be a world-class financial analyst and financial modeler here. I have already covered this career as one of the top future careers. Apart from the above careers, there are other careers in training and marketing which continue to be top performers and will always be in demand. 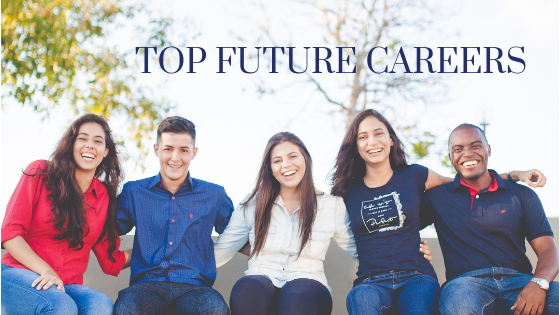 I encourage you to find your passion and make the best out of these top future careers. Haven’t found your passion yet? Read this short but powerful guide to find your passion. Hope you like this post about the best jobs for future. thanks a lot for the information, especially about the Social Media Marketing. I know the importance of LinkedIn in this regard but the measure of importance is stressed by the first part of your article and this will really help me in my career. Yes, all these fields including Social Media marketing will have lots of potential to make a career.